BOND PAID on this BEAUTIFUL GARDENIA Designer w/1955 sq ft in the Village of SANTIAGO. As you drive up notice the curb appeal of the STAMPED driveway, professional landscaping w/palms, shrubs, rock walls, curbing and rockery. Step into the foyer and notice the large TILE flooring; CROWN MOLDING and PLANTATION SHUTTERS are throughout the home! Straight ahead is the living room and dining room w/sliders to the ENCLOSED lanai under HEAT/AIR. The kitchen features LIGHT OAK cabinets with pullouts, pantry, LOVELY GRANITE counters, TILE back splash and TILE flooring. The casual kitchen nook is a great area to enjoy your morning coffee or sit at the GRANITE breakfast bar. The master bedroom features vaulted ceiling, sliders to the lanai, his/her closets and en-suite bathroom w/UPDATED WALK-IN SHOWER w/beautiful FRAMELESS GLASS DOORS & TILE SURROUND, his/her sinks, cultured marble counters, pocket door to separate commode area and large linen closet. Enter the guest area off the foyer; the front bedroom/den (no closet) has TILE FLOORING; the guest bathroom features cultured marble counters and tub/shower w/tile surround and window; the 2nd guest bedroom has carpet flooring and a mounted TV. Step out of the living room through sliders to your 28x11 ENCLOSED lanai under heat/AIR with a SUMMER KITCHEN, SUN SHADES and TILE flooring. This is a BEAUTIFUL home w/dcor colors, solar tubes and more just waiting for you. 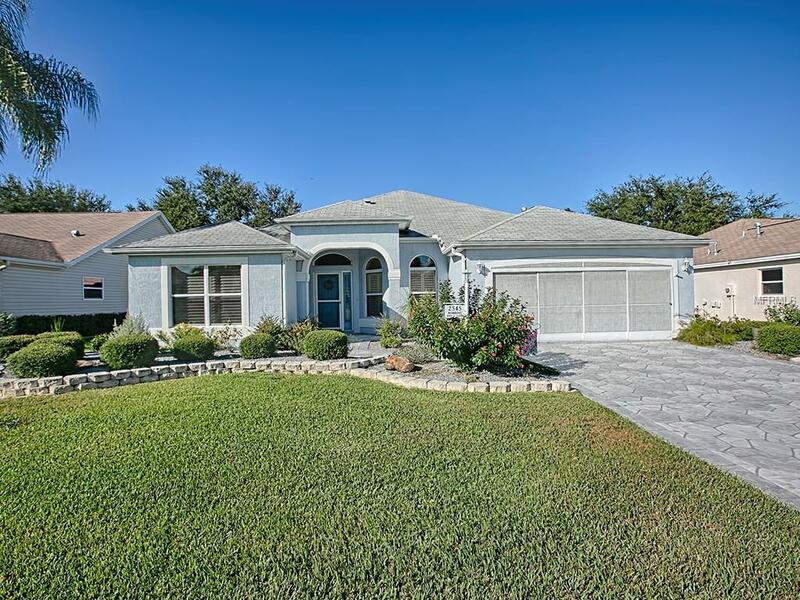 FABULOUS location close to golfing, swimming, restaurants, and more.